It might even be the best on Earth, if you believe the Michelin restaurant guide, which awarded a single star to Tokyo ramen establishment Tsuta. This is a world’s first. This is a big deal—especially if you are into ramen. The announcement made the evening news in Japan. No other ramen restaurant anywhere in the world has ever gotten a Michelin star. But, if you are into Japanese ramen, you might already know about Tsuta. According to The Japan Times, where I am a columnist, the noodles are made from flour ground by stone from four different kinds of wheat. So, yes, these are soba noodles, but Tsuta serves them ramen style, in either a salt soup or a soy sauce soup. The soup is a blend of chicken and seafood, and the resulting ramen is all natural, free of any chemical flavorings and additives. According to Ramen Adventures, the soy sauce ramen is made from a special blend of three soy sauces: The main sauce is from a small island in Japan’s Inland Sea, while the others are raw unpasteurized soy sauces from Wakayama and Ibaraki. “The resulting taste is an intense, slightly sweet mix,” writes Ramen Adventures. Whether or not you agree with Michelin stars, or ratings, or whatever, it’s fantastic to see a Japanese ramen restaurant get this kind of global attention. 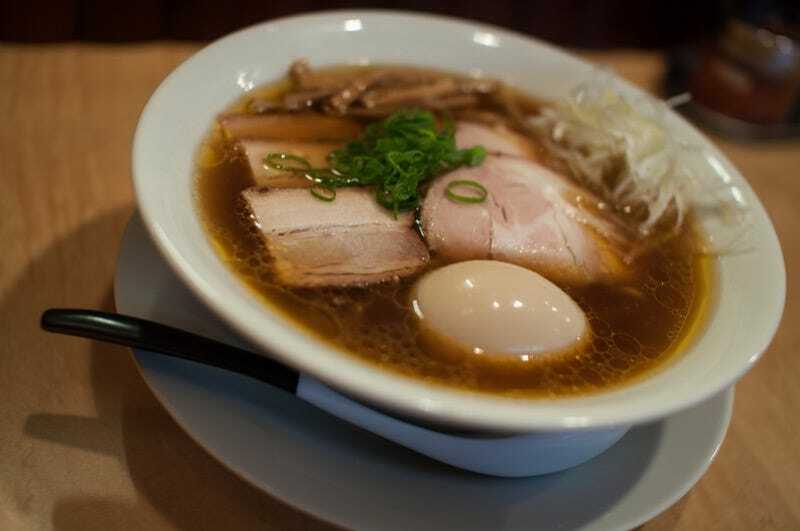 If you are keen to try this ramen for yourself, TimeOut Tokyo has directions. The wait time, The Japan Times previously wrote, is usually around thirty minutes. No doubt, those lines are going to get longer. A lot longer. Be sure to check out Ramen Adventures for more Tokyo ramen reviews and photos.